Leading Edge Simulations has posted more official in-sim previews from the upcoming Douglas DC-3 for X-Plane 10. FS2Crew has released service pack 1 to the PMDG Boeing 737NGX Edition for FSX. Available at the FS2Crew Online Store. FSPilot Magazine has released issue number 2, available to download for subscribers at the FSPilot Website. Pacific Islands Simulation has posted new previews from the upcoming Nauru International Airport (ANYN) for FSX. QualityWings has announced USD 47.99 pricing of the upcoming Ultimate 146 Collection for FSX and FS2004. - FMC, capable of SIDS, STARS, Altitude Restrictions, Holdings, Fixes, etc. Nemeth Designs has posted the first beta screenshots from the upcoming Eurocopter AS355 Ecureuil 2 for FSX. LHSimulations has updated the Library Base Pack for FSX and FS2004 to cycle 04-12. Available to download here. Orbx is holding their last ever sales event with 44% off on all download products (except 2W3 Swanson) during April 2012. Carenado has posted final interior previews from the soon to be released Beechcraft King Air C90 for FSX. The freeware FlightPort Bad Dürkheim X (EDRF) scenery V1.1 is now also available for X-Plane 9 & X-Plane 10. The Godzone Virtual Flight Real New Zealand Wellington City and Airport for FS2004 is now available as freeware. The freeware St-Valery Vittefleur Aerodrome (LFOS) for X-Plane is now available to download at the XPFR Website. Pavel Pranov has posted this autorotation video from the upcoming Mil Helicopters Mi-2 for X-Plane 9 & X-Plane 10. XPFR has released the freeware Xtreme Air Sbach 300 aerobatic aircraft for X-Plane. Available at the XPFR Website. The Virtavia North American F-86 Sabre for FSX and FS2004 is now 50% off at PC Aviator. Valid until April 6th 2012. 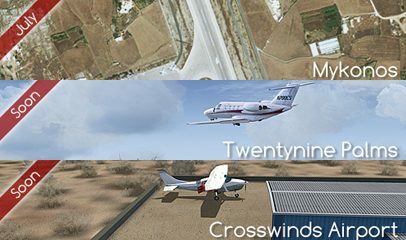 Twentynine Palms Scenery Design has updated the roadmap of upcoming scenery projects for FSX and FS2004. The Airport Guys have added more previews from the upcoming Myrtle Beach International Airport (KMYR) for FSX. Synchro-Soft has released the Mooney M20 Lycoming IO-360-A Soundset for FSX. Available at SimMarket. LatinVFR has released Caracas Simón Bolívar International Airport (SVMI) for FSX (FS2004 version in the following weeks). - Native vehicle animations FSX. - Planned FS2004 version free for those who purchase the initial release. GrandSurf has posted previews of the terminal from the fictional SM1 Airpark near Brownsville Oregon for FSX. Blue Sky Scenery has released the freeware Palmdale (KPMD), Lake Rosamond photo scenery for FSX and FS2004. The freeware Lübeck Blankensee Airport (EDHL) scenery for X-Plane 9 & X-Plane 10 is now available at X-Plane.org. Shade Tree Micro Aviation (STMA) has released the North American Rockwell OV-10 Bronco for X-Plane 9 & X-Plane 10. Thai Creation has posted the first development pictures from the upcoming FSX version of Paro Intl. Airport (VQPR). GSnext has released Aérodrome de Bordeaux Saucats-Léognan (LFCS) for FSX. Available to purchase at SimMarket. - Photorealistic ground, snapped in 25cm by pixel! FSBreak Episode 109: Super Review Episode, and Some News... is now available at the FSBreak Website. QualityWings has posted this beta testing video from the upcoming BAe146/Avro RJ for FSX and FS2004. MilViz has added new virtual cockpit previews from the upcoming Boeing 737-200 for FSX to the Facebook album. LatinVFR has posted more development previews from Caracas Simón Bolívar Intl. Airport (SVMI) for FSX and FS2004. Orbx has released Swanson Airport (2W3) for the FTX North America PNW region. Details at the Product Page. - Includes amazing new PeopleFlow 2! Carenado has posted final preview screenshots from the soon to be released Beechcraft King Air C90 for FSX.